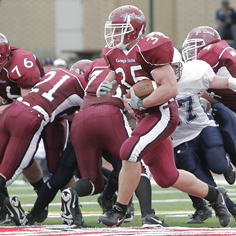 The Carnegie Mellon Tartans will be playing for an NCAA Football Championship, following a perfect regular season ending Nov. 11, 2006, with a 14-7 victory at Thiel College. This will be first time the university's football team has captured an NCAA playoff berth since 1990. "It's exciting, it's been 16 years since we've made the national tournament," said Coach Rich Lackner on making the field of 32 playoff teams. Preliminary round action starts Saturday, Nov. 18, and game time is set for 12 p.m. Carnegie Mellon will host Millsaps at Gesling Stadium. In addition to the spotless season, several Tartans players are setting high marks of their own. Junior Travis Sivek became the university's all-time leading rusher with 2,912 yards and more than 1,000 yards this season alone — only the second Tartan to reach 1,000-yards in a single season. Robert Gimson, also a junior, is close behind with 902 yards. And senior Aaron Lewis, a defensive back, is a finalist for the Draddy Award, given to the top scholar-athlete in college football. An NCAA Division III team, Tartan football players are nationally respected for their game on the field and in the classroom. Lewis was also an Academic All-America in 2005. Between 1970 and 2005, the team has earned 54 Academic All-America recognitions. This year, 12 players made the Academic All-District, with eight moving on to the national ballot.